Back by popular demand, KostaMUA is here tell us all about his favourite look, a character mashup of Michelle Pfeiffer’s Catwoman from Batman Returns and Sally from Tim Burton’s Nightmare Before Christmas. Meow! I have a weird relationship with my ‘Catwoman/Sally Mashup’ post. It was a lot of firsts. My first full body paint. My first big character paint. My first mashup. My first tutorial video (which a friend actually volunteered to put together, bless her). My first time painting fabric (and of course it was vinyl…because why would it be anything easy?!). And it was my first online collaboration with other MUAs. I can’t even tell you the stress this look gave me. In the end I was thrilled with how it came out and so proud of the immense effort I put into it…But it hardly made a blip online. Barely anyone outside of my following saw it. I was so disappointed (still am actually). But – it’s still one of my favourites, if not my absolute favourite. And the video my friend made for me was awesome! I actually started a YouTube channel and post tutorials now because of that. Kosta MUA, of course. SUBSCRIBE AND FOLLOW! Is it difficult to be the subject of your own living art? I honestly find it easier to paint on myself. I have a tendency to zone in when I work and can get very quiet. I think that can unsettle people. Also, when I’m working on other people I have to actually consider them! There’s a person sitting in my chair! I have to make sure they’re comfortable, they’re fed, they’re basically not going to faint. Me?! Who cares if I haven’t eaten in 10 hours, the only person who suffers is me. Also, other people talk and that pulls my focus. 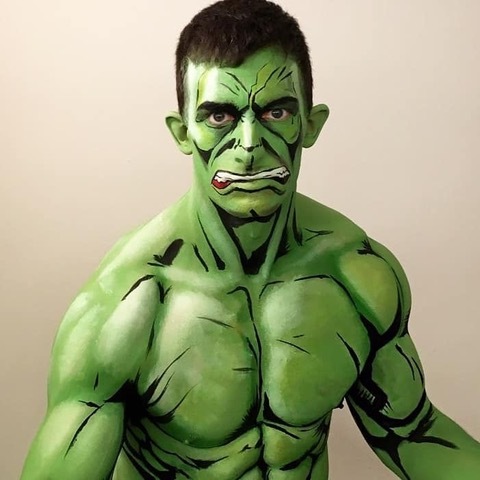 KOSTAMUA: Model painted as The Hulk. How long does a character look take? A character look is hard to gauge. It really comes down to size, detail and product. Something that might SEEM simple can actually be incredibly difficult. The HULK look is a perfect example. A very talented artist friend of mine (@chrislotts …check him out…the talent is insane) contacted me because he had a friend that wanted a full body paint of a superhero for Halloween. I didn’t need to hear any more. I was IN! But stupid me forgot to find out *which* superhero. Turns out he wanted to be painted as The Hulk. How could that possibly be anything but easy, right?! Wrong! Oh so very wrong, my friend. What you may think is one colour is, in actuality, a RANGE of colour in the same HUE *head explodes emoji*. And we wanted to go with a very specific comic book 2D Hulk style…so there was THAT to contend with too. I’ll say this, green used to be my favourite colour. In the end, the client was very happy with the result but it was seriously one of the biggest underestimations I’ve ever made regarding a look. Lesson learned. Do you see yourself as an artist and people as canvases? I see myself as an artist, sure. 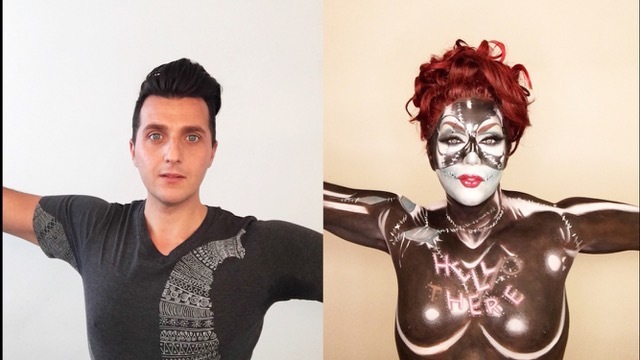 I am an artist, in makeup and in other things. As for other people, I’m not sure how to answer the question. I don’t think I have the ability to disassociate people from their bodies. Why would I even want to? That’s almost a horrifying thought. So I guess, no, I don’t think of people as canvases. I see them as people who are generous enough to allow me to express my art on them. Who is your ideal canvas? This answer is the same as above. I don’t really have an ideal canvas. I don’t think I have the ability to disassociate people from their bodies. Why would I even want to? That’s almost a horrifying thought. I don’t think of people as canvases. I see them as people who are generous enough to allow me to express my art on them. I do have some ideas for looks or a series of looks I’m thinking of putting together. Some of the looks will be on me and others on various models or friends who have volunteered their time and faces and bodies. I’m actually really excited because I’m hoping to collaborate with some fantastic artists this year. There has been mention of a very exciting team up sometime soon that should have a lot of fun new looks and pics. I think this is going to be a pretty busy and big year! KostaMUA, it has been an absolute pleasure getting to know you. Thanks again for stopping by! I can’t wait to hear how you get on in 2019. If you want to know more about KostaMUA check out his details below. Remember to SUBSCRIBE AND FOLLOW! KostaMUA: Girrrl does Shekosta Lott!